Just getting their walking feet! These wanna be toddlers are 12 to 24 months old. Their are 8 children in the class and 2 teachers in the room with an extra set of hands available for lunch time everyday. They are just starting to experience the sensory table, some creative art and a little bit of story time at the lunch table while the teachers are getting plates ready. They love music, bubbles, throwing and climbing on everything! We have 3 toddler rooms at New Day. The Terrific Twos! There are two teachers in the toddler room and there can be up to 10 children in each class. Each class has a daily schedule that includes table activities, (puzzles, play dough,) sensory play, stories, songs and an opportunity to do a creative art activity. Outdoor play is part of our program and it is built into the children's daily schedule. The three year olds have busy days with lots of fun things to do. They love to make things and bake things and listen to stories. It's great fun to learn the Days of the Week song and shake your sillies out! The children enjoy outside play and Wednesday mornings at the Farmers Market in the summer and fall. There are 2 teachers in each of the three year old rooms and they can have up to 14 children when we are full. New Day Children' Center is currently collaborating with the Watertown City School District to provide 1/2 day Universal Pre-K. The program is located at Starbuck Elementary School. 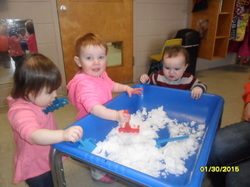 The environment is set up to be Developmentally Appropriate with an emphasis on hands on learning activities. Many of the children in this program are experiencing their first time in a group situation. 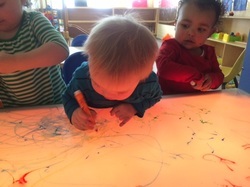 Learning takes place in center based activities such as creative art, sensory play, the block area, dramatic play, the writing table and of course circle time! Applications can be obtained through the WCSD website. Morning and afternoon options are available. For more information about the program you are welcome to call New Day. Four year olds are getting ready to take the big step off to Kindergarten! With 2 staff in the room during UPK time, the teachers work hard to help the children become independent and ready to learn. They are busy gaining new skills and learning how to cooperate and negotiate with each other in a group setting. They love dramatic play, art, circle time, the writing table and the big blocks! Children who are enrolled in the full day program have the opportunity to participate in swim lessons at the YMCA, walk to the Flower Memorial Library, and visit the Farmer's Market on Wednesdays. Learning takes place with lots of hands on activities throughout the day. Our program provides children with a preschool program that will help to prepare them for Kindergarten and allow parents to meet work and school obligations without having to transfer their child halfway through the day. During February and April break and for 8-9 weeks during summer vacation, we offer parents a program for school age children from five to twelve years of age. If the demand is high we lease space from IHC Primary, directly across the street from the Center, where we can accommodate 54 children in our full day program. Currently, we have been able to accommodate the school age children in our Franklin Street location. We are proud to admit that many of our School-Age children attended New Day when they were little or have a younger sibling enrolled in our day care center. Parents pack a bag lunch everyday and we provide breakfast and afternoon snack. School vacations are about having fun. The kids enjoy crafts, board games and hanging out with friends. We plan ahead to make sure that they have a schedule full of activities outside of the Center (such as bowling, swimming, walks to Thompson Park, and field trips to area attractions), as well as outdoor play every day and time in the gymnasium.